A new Scottish tourist trail showcasing the country's best gin distilleries and bars has been launched in a bid to capitalise on a revival in its popularity. No longer dismissed as "mother's ruin", British gin is experiencing an international renaissance and Scotland's craft gin industry is flourishing. The spirit is worth £1.76bn to the UK economy and about 70% of it is produced in Scotland. 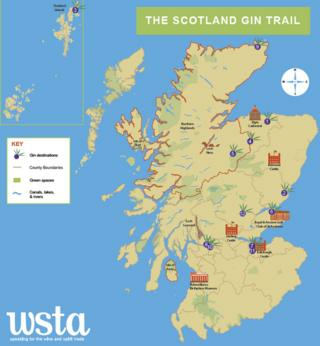 Now the Wine and Spirit Trade Association (WSTA) hope the new Scotland Gin Trail could boost the industry's fortunes further. It features distilleries as far afield as Shetland, Moray and Perthshire as well as specialist bars in the Central Belt. However the map is not comprehensive and the WSTA want to hear from more distillers keen to feature in the trail. The Crossbill Distillery, which is based on the Inshriach estate near Aviemore, is one of those which is on the map. Although it has been run commercially for just 18 months, owner and master distiller Jonathan Engels said the business is doing exceptionally well. But he believes the gin revival is not just a fad, instead the industry has benefited from a change in shopping habits. "People used to go to Tesco and get all their shopping," he said. "Now they get Ocado to deliver it and they go out and buy their luxuries. "The boom in independent shops has been caused by the change in people's shopping habits. That's accelerated or even enabled the [gin] sector." Mr Engels has seen the evidence first-hand. Before Christmas he made a batch of gin from a single 200-year-old juniper tree. Despite the £85 price tag, all 200 50cl bottles sold out in advance. Organisers of the gin map hope the new initiative can mirror the success of the well-established whisky trails in Scotland. Last year research revealed that there were around 1.5 million visits to Scotch whisky distillery visitor centres in 2014. Incredibly, they spent a total of almost £50m on tours and in their shops and cafes - up from £27m in 2010. And Elizabeth Truss, the UK government's Environment Secretary, has revealed ambitions for UK gin exports to rival the success of whisky, which reached £4bn last year. She said: "There has never been a more exciting time for the industry, with the UK being the biggest exporter of gin in the world, selling enough to make 1.6bn gin and tonics. "I want to the harness the ambition of our Scottish gin-trepreneurs, helping them to grow the UK's reputation for quality gin both here and abroad. "I want to see it up there with Scotch whisky in terms of global sales." In addition to sampling the product, visitors to the Scotland Gin Trail will be able to learn more about the art of gin-making. They will be introduced to the distinctive taste of each gin - including one from St Andrews which is flavoured with retired golf clubs. Mike Beale, chief executive of the WSTA, said: "This is a hugely exciting time for everyone involved in the UK gin industry and our gin trail is the start of a fascinating venture to share the origins, art and innovations involved in producing this Great British spirit. "British gin has a strong, vibrant history. By publishing the gin trail map we hope to mark its renaissance and ensure its future as a quintessentially British, internationally spirit." The "hard work and ingenuity" of the distillers has also been praised by Scottish Secretary David Mundell. "Our distillers are creating some unique gins by experimenting with techniques from the whisky industry and using new blends of local botanicals - it is really exciting to see such innovation within out great tradition of gin distilling," he added.